Will You Have To Pay Spousal Support In Your Divorce? One of the most common questions asked by couples going through a divorce is who will have to pay spousal support. Spousal support is not the same as child support nor can it be included in the division of assets. The final decision as to who will pay spousal support, also known as alimony, will be left to the discretion of the judge. Any tax situations which could arise as a result of the support, and more. If you want to find out if you will have to pay spousal support, a Virginia Beach divorce lawyer from our firm will be able to review the circumstances of your divorce and assist you in determining how the judge is likely to rule. Our law firm is known for the hard-hitting representation our lawyers provide. We can handle all aspects of a divorce and we will be a steadfast advocate for you when it is anticipated spousal support will need to be paid. Spousal support has to be fair and it needs to be within the supporting party’s ability to pay. Our lawyers are compassionate to your situation and we do not want to see you unnecessarily stressed out about finances after your divorce when you should be concentrating on getting started with your new life. 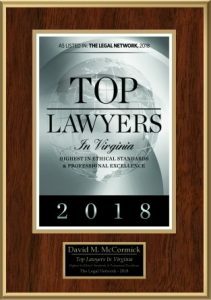 To improve your chances of getting a fair and just determination, we advise you waste no time in hiring a lawyer from the David McCormick Law Group. Contact our firm today to schedule a free initial consultation.